LEWISTOWN — The United Methodist Men of Mifflin County have announced the schedule for the Lenten Prayer Breakfasts. All are scheduled to begin at 7:30 a.m. For more information, call the Rev. Randy Traxler at (717) 242-8718. ¯May 4 — Trinity United Methodist Church, S. Main St., Lewistown — Women’s appreciation breakfast. PORT ROYAL — Men’s prayer breakfasts are set for 7 a.m. on the following dates. The meals will be served at the Port Royal Community Building, 212 4th St.
MIFFLINTOWN — St. Jude Thaddeus Catholic Church, 3918 William Penn Highway, Mifflintown, will offer fish Lenten dinners 4-7 p.m. Friday evenings through April 12 in the church social hall. All-you-can-eat meal: fried and baked fish, popcorn shrimp, fried clams, french fries, macaroni and cheese, stewed tomatoes, corn, green beans, cole slaw, applesauce, rolls, pudding and a selection of homemade desserts. Pay at the door. Adults $12, ages 6-12 $6 and free for 5 and under. The church is located directly across Tuscarora Junior High School. Information: (908) 892-0271. MIDDLEBURG –St. Paul’s (Erdley’s) Lutheran Church will host a soup and bake and rummage indoor yard sale 8 a.m. to 2 p.m. March 23 to benefit the church outreach and missions. Beef vegetable, ham and bean, chicken corn soups and baked goods will be available. Clothing of all size, household items, crafts, toys and books will also be available. $2 per bag of clothing 1-2 p.m. only. Church is located at 2337 Erdley Church Road. REEDSVILLE — Church Hill United Methodist Church will host its first monthly camps for adults from 11 a.m. to 1 p.m. March 23. The event, “Getting to know each other,” a way for participants to learn about each other and help each other learn how God works with us to do that. There is no cost and refreshments will be served. The second camp and class will be held 10 a.m. to noon April 6. A mosaic class will be held. Participants will learn to make crosses for Easter time. The teacher will be Julie Snyder and the cost is $20 a person. A tea and music event will be held with Bill Peightel on May 11. For information or to sign up, call (717) 667-3778. REEDSVILLE — Reedsville United Methodist Church, 60 E. Logan St., Reedsville, is baking whoopie pies to benefit church improvements. Order ahead at (717) 667-3778 for your choice of peanut butter or white cream filling. Cost is $1.50 per pie. Pick up at the church 11 a.m. to noon March 23. MOUNT UNION — The Pentecostal Freedom Church of Mount Union will be hosting a special music concert at 6 p.m. March 24. The singers and musicians from the surrounding area will include Paul Zook, Erica Wilson, Trena Figard, Tonya Stoner, Over the Hill Gang, Sisters in Song, Gerry Kane, Dawn Kauffman, Linda Shope, Jerry Hammonds, Janet Brooks, Mary Ann Stidfole and Jimmy Treaster. Music styles will include southern gospel, country gospel, praise and worship and contemporary Christian. The church is located on state Route 522 South between Peights Store and Parks Garbage. It is open to the public and there is no charge, but a free will offering will be accepted. SHIRLEYSBURG — A special music service will be held at 6 p.m. March 24 at Pentecostal Freedom Church. All are welcome. A free will offering will be accepted. The church is located at 14779 Croghan Pike, Shirleysburg. LEWISTOWN — Pine Glen Christian and Missionary Alliance is hosting a 13-week GriefShare session, 4-6 p.m. Sundays from through June 9. The church is located at 1058 state Route 103 N., Lewistown. Sessions will include: “Is this Normal?,” “The Journey of Grief,” “Stuck in Grief,” “Why?,” “Challenges of Grief” and “What do I live for now.” Information: (717) 899-6900 or (717) 242-4417. BURNHAM — A Methodist Men’s Lenten prayer breakfast will be held at 7:30 a.m. March 30 at Freedom Avenue United Methodist Church. Maundy Thursday service held at 7 p.m.
REEDSVILLE — Church Hill United Methodist Church will host its Maundy Thursday service at 7 p.m. April 18. All are invited to worship. Holy communion will be offered. MIFFLINTOWN — Cornerstone Community Church will host Mission Weekend March 30 and 31. Missionary speakers from “Advancing Native Missions,” will discuss what God is doing in China, North Korea and Mangolia. The event will be held noon to 2 p.m. Saturday. Sunday school will be held at 9 a.m. Sunday and worship will follow at 10 a.m. All are welcome. LEWISTOWN — The Last Supper will be performed on March 31 at Maitland Church of the Brethren, 315 Crossover Drive. Attendees will be able to hear each disciple testify of his relationship to the Master and Teacher, Jesus Christ. The play includes stirring monologues, Christ-centered music and multimedia and the dramatic testimony of The Centurion, who’s conversion at the foot of the cross is described in the books of Matthew and Mark. Due to the intense and graphic nature of some parts of the program, it may not be suitable for young children. Refreshments are served at 6 p.m. and the performance begins at 7 p.m. For more information, call (717) 543-6200. PAINTERSVILLE — Paintersville Christian and Missionary Alliance Church3195 Back Maitland Road, is having a free ladies craft day 9 a.m. to 5 p.m. April 6 with lunch included. Any craft that can be safely done indoors at a 4-foot table space is welcome. Call the church office to register with your name, phone number and type of craft. For more information, call the church at (717) 543-5249. McALISTERVILLE –Mercy Run will perform at 6 p.m. April 7 at Stony Run Mission, 2825 Evendale Hill Road, McAlisterville. MIFFLINTOWN — A Lenten tea for women of the community will be held at 9:30 a.m. April 10 at Messiah Lutheran Church. BELLEVILLE –The following Easter services will be held at Watts Memorial United Methodist Church, 16 Walnut St., Belleville. McALISTERVILLE –Elliott Osowitt will speak at Bunkertown Church of the Brethren on Palm Sunday, April 14 during the 9 a.m. service and at the church’s love feast/communion service at 7 p.m.
REEDSVILLE — Reedsville United Methodist Church will host a free movie night at 6:30 p.m. April 14. Refreshments will be served. All are welcome. “I’m Not Ashamed” will be showed. BURNHAM — Walnut Street United Methodist Church in Burnham will host a Maundy Thursday service at 7 p.m. April 18. The church will also host a special worship service at 9 a.m. April 21. LEWISTOWN — Trinity United Methodist Church in Lewistown will host a Good Friday service at 7 p.m. April 19. A sunrise service and breakfast will be held at 6:30 a.m. on Easter Sunday, April 20. A 10:30 a.m. worship service will also be held on April 21. McALISTERVILLE — “Sonrise” service will be held at 7 a.m. April 21 at Stony Run Mission, 2825 Evendale Hill Road, McAlisterville, with Danny Stouffer sharing. Easter service will be held at 9:15 a.m. with the children sharing a short cantata and Bernard Carpenter sharing a message. 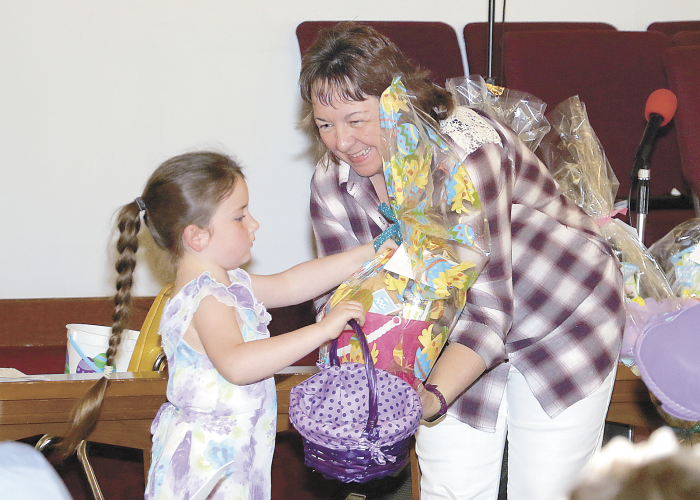 LEWISTOWN — Grove Memorial United Methodist, 611 S. Main St., Lewistown, will host a combined Easter sunrise service at 6 a.m. April 21 with Lake Park United Methodist Church and Freedom Avenue United Methodist Church. Continental breakfast will follow. A regular Easter service will be held at 10:45 a.m.
McALISTERVLLE — Joel Hess will be sharing during the 6 p.m. April 28 service at Stony Run Mission, 2925 Evendale Hill Road, McAlisterville. McALISTERVILLE — Pastor Nick Smith will share during a Mother’s Day service held at 9:15 a.m. May 12 at Stony Run Mission, 2825 Evendale Hill Road. No evening service will be held.